Home » MG Blog » Want More Holiday Sales? Ever wondered why that beautifully printed holiday direct mailer or creatively designed email blast didn’t work as well as you’d hoped? Was it the messaging? The list? The headline or subject line? Maybe it wasn’t any of these. Maybe it was the timing. According to eMarketer Retail, consumers are shopping for the holiday season earlier than ever. In fact, according to TrendSource, 54% of online shoppers are completely finished with their holiday shopping on Cyber Monday. For these buyers, it doesn’t matter how well designed or printed your communication is. If it comes after Cyber Monday, they aren’t listening. The trend toward increasingly early holiday shopping has been around for a while. As tracked by eMarketer Retail, the five-day period between Thanksgiving and Cyber Monday has been taking an increasing share of online holiday spending for the past three years. Citing comScore data, eMarketer Retail reports that the percentage of holiday spending that occurs during those six days has risen from 16.2% in 2015, to 16.8% in 2016, to 17.7% in 2017. Sales occurring on Cyber Monday, the Monday after Thanksgiving, have shown a particularly large jump: comScore found that Cyber Monday sales saw 26% growth in 2017 vs. 15% the year before. What does this mean for you? If you want to reach these buyers, you need to get your holiday mailings out before Thanksgiving. You may still want to do a mailing or email blast in early December, but if you’re going to catch the early birds, you have to be an early bird, too. Start your design and concepting now. If you’re used to getting your marketing cranked up in early November, you’ll need to start a full month earlier than usual. Plus, you may want to come up with different messaging and imagery than you would typically use in a later holiday blast. Need help? 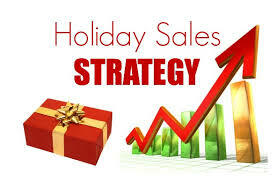 Talk to us about setting a realistic marketing schedule for your holiday promotions. You might need to give yourself more time than you think. 10 Reasons to Work with an Independent Distributor. What’s a great way to sell products and deepen customer loyalty at the same time? next post: Does Personalized Content Marketing Work?